IT consulting used to be completely time and materials or break/fix. When something breaks, a tech fixes it. But then only if the problem is significant enough for your staff to report it. Since everyone has a different threshold of tolerance for computer problems, some problems may impact your employees productivity, but never be addressed. Having a single staff member responsible for IT creates problems too. Do they have the systems and processes to continually improve? What if that one person is not available during a crisis? Break/Fix Starts with Break. Break Is Bad. If your staff uses technology, the single biggest factor affecting your technology costs is the productivity of your people. If they are unable to do their jobs productively, they still get paid. The costs of technology breaking is high. Much higher than what is paid to your IT provider. Many issues that impact productivity go unreported. Staff knows there is a commitement from them required to initiate a service request. They will have to disrupt their day to call or email and allow someone to work on their system. So many times the issue that hinders their productivity but does not exceed their tolerance for technology problems go unreported. Like a dripping faucet that leads to big water bill, the productivity hit slowly adds up. Proactively improving processes to reduce the number of problems per endpoint is central to the way we deliver IT services and critical to reducing your overall technology costs. 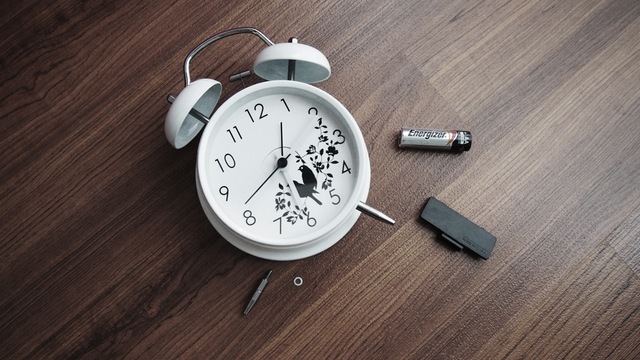 The single most important thing IT providers can do is schedule time for proactive service. This isn't time to address reactive tickets or problems. But time specifically meant to do nothing but look for ways to improve your IT systems, make them more reliable, have better documentation, and increase productivity. This is what drives a client's business success. Break/fix relationships have an incentive not to do this. If nothing breaks they don't get paid. Yet we know that technology breaking is the biggest driver of technology expense because it impacts payroll costs. Not only does T&M have an incentive not to prevent problems, there may be reluctance to initiate proactive work because it will have to be justified on an invoice or performed at no cost. There are best practices and procedures that are in the best interest of the client but if the provider is left with the choice of justifying the work or doing it at no cost, the threshold to do the work is high. Many times this means small items that should be done but would be tough to justify are not done. Over time, just like that dripping faucet, it adds up. Business and technology strategy are usually missing from break/fix. Or they are limited if they are there. Strategy, planning, budgeting, and improving are critical to the success of our clients. Meeting with them regularly to provide this "virtual CIO" service helps them make decisions based on what they know, not based on what they don't know. Time and Materials rarely does this. It's tempting to hire someone internally when you've done the same for other positions and probably with some success. IT is different. Will a single IT person be able to implement all of the procedures, documentation, proactive work, systems, and peer review necessary to deliver great IT? How will you manage an internal IT person who knows more about technology than you do? Do you have the time to commit to managing IT? There is an incentive for internal IT to keep things close to the vest for "job security". This essentially holds you hostage to a single person who controls the productivity of the entire company. If you only have one person who knows your IT, what if they leave? Years of experience and knowledge of your business and employees could be gone almost overnight if your IT person becomes ill, gets a new job, or retires. Beyond their salary, you'll have to pay benefits, payroll taxes, give up office space, and incur management time. Some companies even have a double worker — someone who runs the IT as well as holding another position in the company. But because they're split between two responsibilities, they likely won't do well in either one. It will be very difficult to stay up on current trends and they'll lack the practical implementation experience of a full time worker. An internal employee will only be exposed to managing IT for your one company. Outsourced professionals benefit from the experience of managing many client IT infrastructures. This experience translates into more efficient resolution of problems and better long term strategy for your organization. Don't deal with all of these headaches. 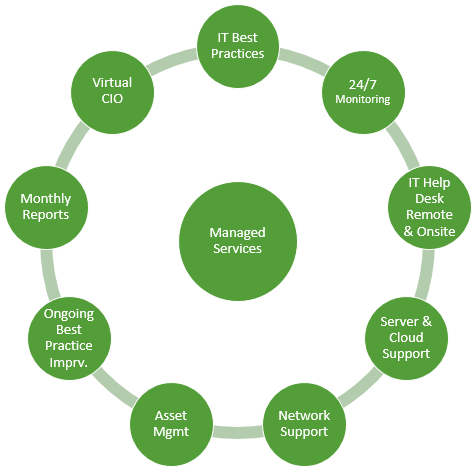 Outsourced managed services are the most efficient system for you and your business. With managed services, you don't have to worry about your IT; we take care of it for you. 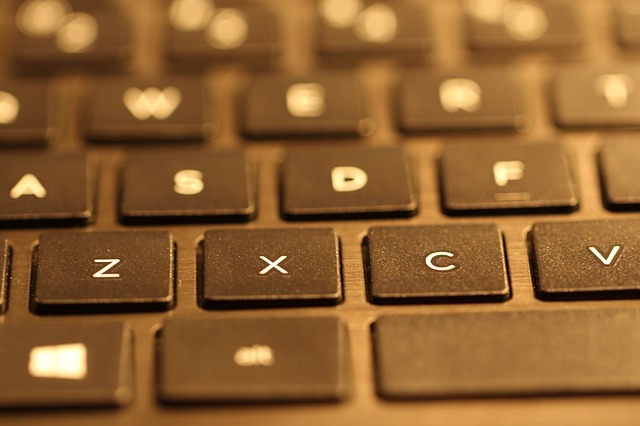 We are proactive IT staff, delivering IT service through the Four Foundations of great IT. This lets you focus on what your business needs instead of getting bogged down with technical issues. This proactive approach means costly outages are less frequent, and even minor equipment breakdowns are detected by our automated software so we can get them fixed. You also don't have to worry about someone in-house keeping up with IT; we know the latest tech and advise when it can help your business. Finally, with our expert team, every action we take and aspect of your infrastructure is well-documented, ensuring that team members can switch off on tasks and still have all the knowledge needed. As we spend more time with your company, our documentation for your business grows to include as much useful information as possible. Our range of services is diverse. We provide 24/7 monitoring, remote or onsite helpdesk support from 8 AM-7 PM Monday-Friday, and support for your servers, cloud, and network. We also send out monthly reports to keep you up to date on your assets, along with periodic business review meetings to ensure communication is open. Are you ready to ditch the old models and revolutionize your IT? Contact us today and let's get set up!